Upset by the ouster of former Prime Minister Thaksin Shinawatra via military coup in 2006, thousands of Thai protesters gathered at the walled estate of current Prime Minister Abhisit Vejjajiva and expressed their displeasure at his new job the only way they knew how: they hurled bags of their own human blood at his house. This was after negotiations with riot police who were guarding the residence. 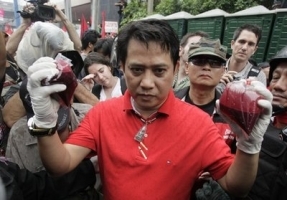 Members of a Thai group backing Shinawatra, the Red Shirts, took to the streets by the thousands before dumping six 5-liter jugs of blood onto the streets in front of Vejjajiva’s home and in front of the home office of the ruling Democrat Party, as well as pouring the blood into bags that were hurled at Vejjajiva’s estate. Weirdly enough, despite the blood and angry looks of the protesting parties in the image gallery, the whole thing was a festive affair. Protesters waved and sang along to loud Thai country music that blared from the back of pickup trucks, and riot cops took pictures with tourists. Protest organizers say they collected a staggering 80 gallons of blood to dump. That’s a waste of good blood. People could use that blood to buy beer or Packers tickets! If one guy can donate 40 gallons by himself, that many people should’ve been able to come up with a few hundred gallons of blood at least!